For over 10 years, you have brought music and life to many. You have gained fans, you have lost fans, and you have kept fans, but no matter what, all of these fans loved you together, even if their time in loving you was short. Together, you gave these fans joy and music, and you made them feel complete. For myself, though I was never truly a fan, there was something there that I did like about you. Mostly, it would have been your music, but looking back these past two weeks at your older works, I also realised that I had come to like, enjoy, maybe even love, the community that you had together as kids, that sense of unity and closeness that was so evident and wonderful back in your childhood years. You were fun, and you made me wish that I had liked you more, that I had been a fan when you were so happy and carefree. Alas, it was never meant to be, so the way I came to know you was bittersweet. I do not regret caring little for you, I admit that wholeheartedly, but I do wish that I had come to know you more. 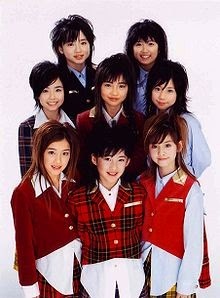 I wish that I loved the members of this group like I love the members of Morning Musume or Juice=Juice, that I cared so much that I researched and watched videos on all of you, and fell in love with the personality of the group, rather than the shallow aspect of your videos or how you looked and what you did. I wish, deep down, that I had spent more time wanting to get to know you, as members and characters, rather than watching what was on the surface. For ignoring you as individuals, truly, I am sorry. For the past year or so, it is obvious that I wished you were gone, that you would disband and go away, and finally, this has happened. It has happened today, and whilst it is sad to know that the girls I like are going away from the Idol industry, I won't lie and say that I am sad; I am happy. I am happy that, finally, all of you will be able to go your separate ways and live your lives, to become the adults that you want to be, and to all pursue your own careers and activities that suit you. I am glad that you won't be held back, that you won't have to play a facade just to keep the fans satisfied. I am glad that, finally, all of you are free. You do not have to put up a charade any more. For a long time, it has been obvious that you were going your separate ways, that you had grown apart and had new ideas with what you wanted to do. It has been clear for a while that you didn't want to be Idols any more, and that you just wanted to grow up and be yourselves, or at least it was to me. That is fine, though, because now you don't have to play this Idol game, and you don't have to pretend. You can do what you want, and you can be free. I will miss the girls. I will miss the funny, charming, energetic personas of Berryz that, somewhere deep down, are still there. I will miss the love the girls had for the group, and the dedication each and every one of them had to keep the group going for 10 years. Your music, I will really miss it, and I will miss the unity you once again showed within Towa no Uta. Though it's not a lot, these are the things that I will miss about you, Berryz Kobou. Though this is a somewhat bittersweet goodbye, I am happier to see you go than I am sad about it, but that's okay; you will be missed by far more people than you will be cheered at for leaving, and I am happy that all of these fans will miss you. You deserve these fans, and they deserve you. In all of your futures, please, be happy. Pursue your dreams, and become the person you have always wanted to be, but forever and always, remember that you are Berryz Kobou, and that you have made so many people happy, even in your days of darkness. For over 13 years, thank you. Even though I couldn't be your fan, and even though I said I wanted you to go away, I really do appreciate you and what you did for Hello! Project. No matter what, even when I say I am happy to see you go, I know that deep down I will miss you. Berryz Kobou, omedetou! Thank you for being here for so long, and thank you for being our Idols! Until the day where you all return to the stage hand-in-hand, please, be successful, and be happy!